Brigid Cooleen suffered a brain hemorrhage on April 25, 2013. She spent six weeks in the specialty care unit at Maine Medical Center, emerging from a coma and improving enough to move to Spaulding Hospital for Continuing Medical Care North Shore in Salem, MA on June 4th. 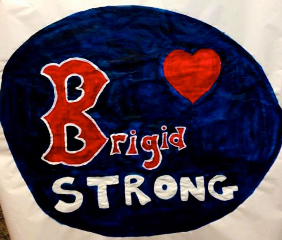 After a brief stay at Mass General Hospital, Brigid moved to Spaulding Rehabilitation in Boston the first week of July and is currently receiving Speech, Physical and Occupational therapies. She continues to make progress in all areas. She communicates with smiles, thumbs-up, hand squeezes, blinks, pointing to objects, and some writing. When she first woke up she wrote “B” and then “what happened.” She is very aware of what is going on around her. It is still unclear what the depth of her rehabilitation will be as the doctors are still not able to fully assess the extent of her brain injury. Brigid has a long road ahead of her, but knowing her strength and determination, along with her amazing family’s love and support, she will get there. Along with her parents, Liz and Paul, Brigid has an older brother Jack who just completed his freshman year at Tufts University, and a twin sister Katie, who will be a freshman at Northeastern University in the Fall. And, of course, her sweet dog, Eddie. Brigid has been dealing with a brain disorder called ROHHAD since the age of nine. It took doctors a long time to figure out what she was suffering from as it is a very rare disorder. Since then Brigid has had to go through many procedures, hospital stays, surgeries and studies. The thing is, you would never know it. She has handled her disorder and some of the limitations it has put on her with courage, strength and grace. 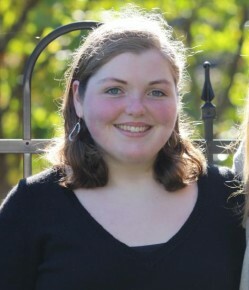 She has taken on every challenge like a true champion, rarely (if ever) complaining.Brigid was an honor student at Falmouth High School where she was also editor of the yearbook and manager of the field hockey team that Katie played on. Brigid is a talented artist, an amazing cook, and enjoys gardening. She also worked at The European Bakery in Falmouth. Sending good vibes and prayers for your speedy recovery! Though we have never met, I know your brother as he is friends with my niece Jenna Serunian. Knowing him and how kind he has been to me is normally a reflection on the persons family. Which tells me you must an extraordinary person! Life will continue to provide opportunities for adversity, how each of us face these is a true reflection of ourselves, from what I have seen you are a person who refuses to give up. God Bless you for this and I pray you will continue to face adversity with resolve! I don’t think that I know you, but you are my best friend’s neighbor, Alison Noyes. I have heard of you from her a little while before she linked this website to me and a lot of other people from Falmouth Middle School. I’m planning on buying some Brigid Strong bracelets and t-shirts. I have been praying for you and I really hope that you get better soon! My thoughts and prayers are with you as you face your greatest challenge yet. Continue to persevere and redefine courage. Your dad is one of my greatest mentors. He has helped me through challengrs in my young life. I know how much he loves and cherishes his relationship with you. There wasn’t a day that went by, when we worked together, when he wouldn’t share a story or provide an update on your success. He was always so proud and is a special person and father. Please stay strong and continue to make strides. You are an inspiration to us all. If there is anything I can do to help I am only a phone call away.